Any of these trips entitles you to at least seven-hours aboard the Sea Breeze. If you catch your limit in a couple of hours (which frequently occurs) we may utilize the remaining portion of your trip fishing for another species or just catch and release. In other words, it is not our policy to bring you back to dockside prematurely. 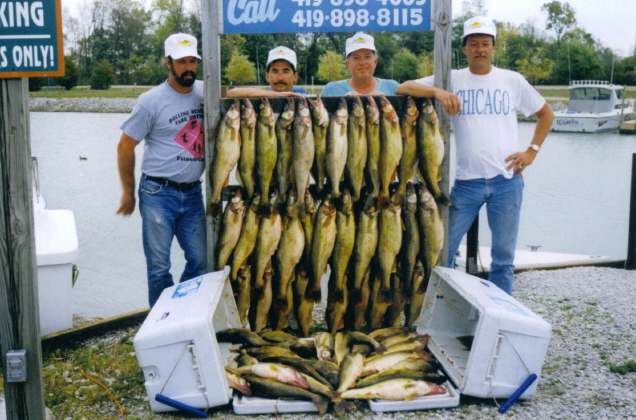 After a long day on Lake Erie you may want to relax in our air conditioned lodging, or you can fish in our fishing ponds for the rest of the evening. Sea Breeze leaves the docks at 6 a.m. or 2 p.m. 7 days a week. Special arrangements can sometimes be scheduled with your captain. Lodging Packages are based on staying at the marina. Please bring cash or checks to pay the full amount of your trip. You can pay your captain on the boat. Credit cards may be subject to a convenience charge. Nothing will be charged to your credit card prior to your charter date. If you would like to go fishing and need to fill in with a group, now you can. E-mail me (bob@seabreezecharters.com) for a list of possible dates & prices.